DKA principals worked closely with Senco Properties, Inc. to maximize the allowable FAR and design a high-end condominium tower that does not exist in this neighborhood of Chicago. Numerous meetings with the Alderwoman and neighborhood groups were facilitated by the principals of DKA during the design phase to ensure buy-in and consensus by the various constituency groups in the area. A glass tower that allows unobstructed floor to ceiling views of downtown Chicago and Lake Michigan is the product. The design is intended to reflect the lower adjacent art deco buildings rather than attempt to mimic their attributes. 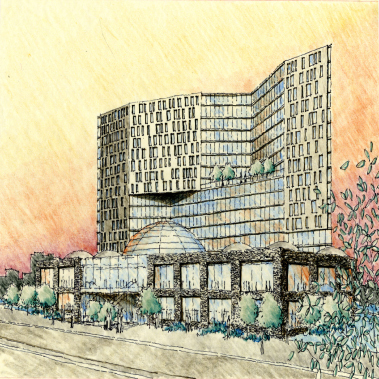 The tower reaches 340’ high and features a walking garden above the parking deck, a ground level drycleaner, and penthouse ballroom with 20’ high ceilings that can be used by the residents.